The success or failure of any organization today depends heavily on its digital abilities to adapt, connect, communicate and collaborate. Knowing that these factors are essential, companies often invest in email, social media, video conferencing and all kinds of other independent digital tools, without implementing a centralized digital workplace strategy. While each of these programs works well alone, employees struggle to update and manage so many tools, causing companies to suffer from decreased productivity and frustration over the nonexistent benefits of their digital workplace. At MangoApps, we understand this irritation and make online communication easy. We provide employees with a simple to use, centralized space for all of their digital workplace needs. The MangoApps Department module is built around improving and enhancing the abilities of departments, teams and even individual employees. To illustrate our point in a little more detail, we’ve outlined just a few of the most influential ways the MangoApps Departments module boosts connectivity, productivity, and engagement. With the intuitive tools available in MangoApps, admins can create a virtual area for each of their company’s physical departments. Department name, description, logo, and assigned admins can be easily assigned and the content of each department page can be established with specific permissions, limiting access to the page as needed. Admins can also manage and configure various modules within the page, organizing the perfect page for each department’s specific needs. Department pages are the perfect place to organize, store and discuss important department information. Department pages are easy to search, access and update, making them ideal for both long lasting and frequently changing company information. Employees throughout the department will have easy access to department guidelines, employee posts, new policies and regular updates in a specific, clutter-free and non-distractive environment. In addition to text, department pages also support images, videos, and multimedia designs. MangoApps department pages help enable straightforward roles and responsibilities within an organization. Department pages can have a single or multiple admins, who can, in turn, take control and drive guidelines within the department. Specifically assigned department admins can also keep information clear and direct, ensuring that everyone within the department understands their role, receives the help they need and are accountable for their efforts. Admins can also manage and inform users about files, wikis, calendar events, posts, and other additional forms of communication as needed. Coworkers can use the department page to easily browse department directory information and employee profiles, allowing employees to stay organized and find who they’re looking for faster. It also helps employees learn more about their departmental colleagues, which builds friendships and boosts connectivity. Employee profiles include rich and detail information that is automatically optimized for easy desktop, tablet and mobile viewing, making it perfect for traditional office work or activities on the go. MangoApps Departments provides up to 15GB of storage per user, keeping files shared within the department safely and securely stored and organized. Users can easily work with large files and can check-in and checkout content to ensure that no one else is editing it at the same time. MangoApps Departments naturally integrate with Office 365, making it simple to edit, co-edit, or view an office document right from your browser or device. Team members within the department can work together on a file without having to download it as well, allowing any user to make auto-saved edit on-the-go. Department specific wikis are also a great tool for collaborating online and capturing knowledge. The departments module makes it easy to create, share, store and discuss information that might otherwise be forgotten or lost over email. Sadly, in any organization, it’s not uncommon for employees to feel that their best efforts are generally ignored. Encouraging frequent employee engagement greatly boosts connectivity and is the best way to strengthen both department productivity and individual employee loyalty. With MangoApps, users can recognize colleagues within their departments and endorse them for their strengths, skills, and successes. Department awards allow for public praise and include an image and personal message. Admins can also establish completely customizable reward and gamification goals within the department to encouraged continued improvement and progress. MangoApps Departments contains trackers and forms to greatly simplify the process of collecting department data, feedback, leads, requests, and any other relevant information. Departments can create their own unique forms or use existing templates to gather information and powerful analytic and processing tools help to generate outcomes and insights from your information. And as always, any collected information is safely and securely stored, while remaining easy to share with groups or individuals throughout the department. Department members can connect with groups or other individuals at any time. Users can initiate a real-time chat, or send an internal message from any device. Instant and private communication allows colleagues the opportunity to implement and receive answers as soon as possible, which in turn, increases work satisfaction and boosts connectivity. Communication also gives peers a place to collaborate together, expand on ideas and discuss upcoming tasks and to-do items. Department pages provide a space to gain important insights into employee opinions, knowledge and expectations. Admins and individual users can create quizzes or polls with all kinds of questions and then easily analyze and interpret the answers. Open forums and collaboration spaces can also encourage employees to address and discuss important topics like job satisfaction, evaluation expectations, department policies and more. MangoApps Departments are made for employee success and give users a centralized and specific place devoted to the goals and outcomes of their individual departments. As employees are able to easily work with their peers and access important information, their productivity and work satisfaction naturally increases. 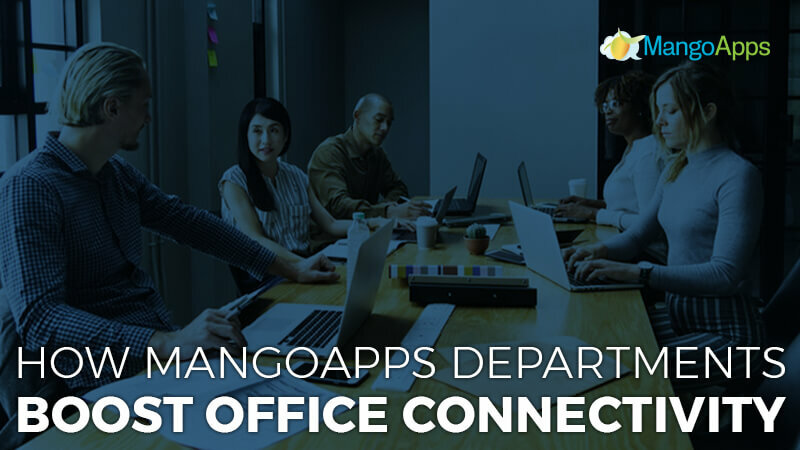 Contact us today to learn more about how the MangoApps Departments boosts connectivity within your entire organization.